A combined effort from a bunch of big names (though sadly not Andre), The Dawson is a two-floor drinking den from restaurateurs Billy Lawless (The Gage, Henri) and Branko Palikuca (Topaz, Amber) with a beverage program from GM Clint Rogers (Henri, Graham Elliot), cocktails from Annemarie Sagoi (Big Star, The Charleston), and food from Next’s former Sous Chef Rene De Leon. 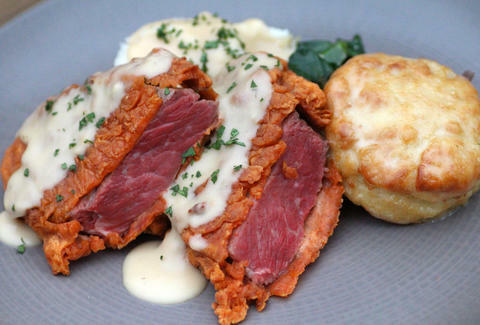 Look for next-level drink pairings for American, comfort-inspired crowd pleasers like chicken-fried NY strip steak with greens, mashed potatoes, and a buttermilk biscuit coated in a honey butter sauce. 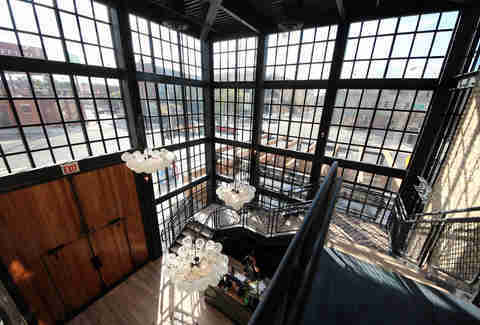 The site originally housed a fireplace mantle factory owned by The Dawson Brothers, the restaurant’s namesake (poor James Van Der Beek). The space seamlessly blends craftsmanship and artistry, as evidenced by this impressive atrium entrance to the first floor’s open kitchen, tucked behind an antique zinc bar. 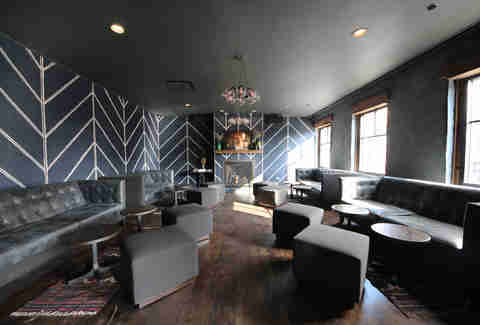 The upstairs dons its best Canadian tuxedo, with denim walls to complement the U-shaped bar and fireplace-equipped private room. With the interior able to seat 200, the outdoor patio -- with a vintage brick fireplace of its own -- has space for another 150. 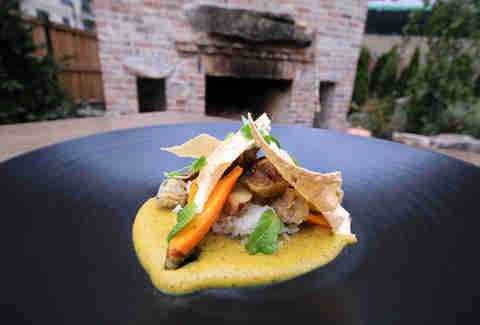 It also has room for this plate of Mughlai curry (taken from India’s Mughal Empire, not the adorable thing from Gremlins) with rice, roasted carrots, fingerling potatoes, fried okra, and crispy papadum. 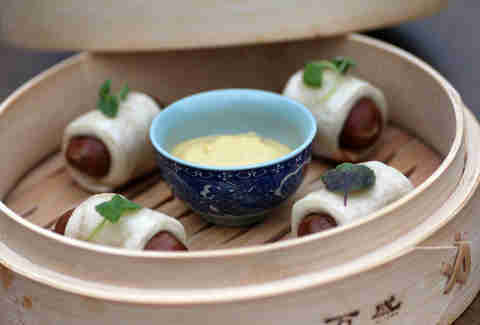 A Chinese-flavored take on a classic football app, these pigs in a blanket are made with Mandarin-style pork sausage, bao, and spicy mustard served in a steam basket. Carb-wrapped sausages transcend all cultural barriers. 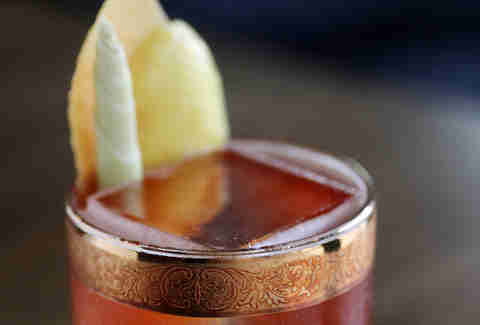 ... this Carillon Cup, made with gin, applejack, vanilla pear shrub, and black walnut bitters. 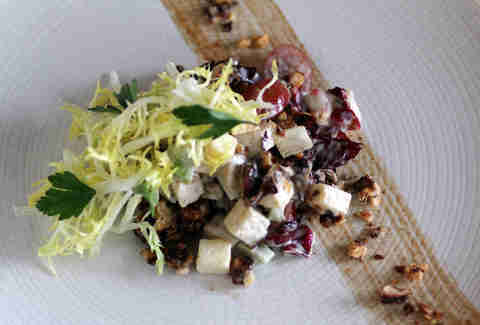 There’s a breadth of aperitifs including a rotating cobbler (not the crumbly dessert kind). 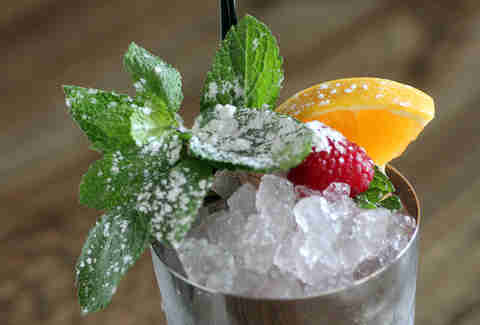 This one's the Scorpio edition of the Zodiac Cobbler (Manzanilla sherry, raspberry, lemon, orange, and mint). And should your date buy into astrology, Scorpio’s are passionate, sensual, and controlling. You’ve been warned. 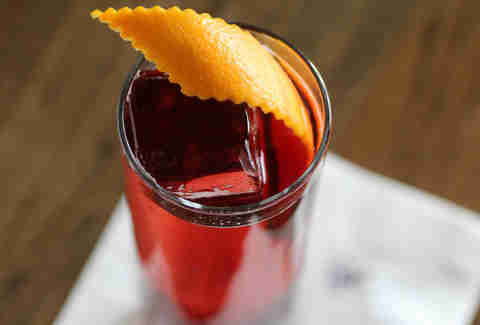 The Luchini mixes an Italian Amaro liqueur, Luxardo Aperitivo, and cherry phosphate, and is one of three sodas made in-house. 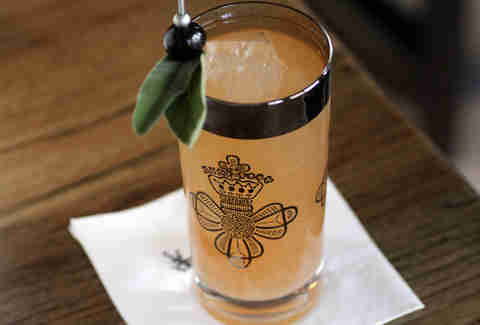 The golden-rimmed Officer’s Club would make you the class of the VFW thanks to Dewar’s 12yr and Bruichladdich 10yr mixed with spicy Thai bitters, and garnished with lemongrass and citrus peels. Of course, sometimes you just want beer and tacos. 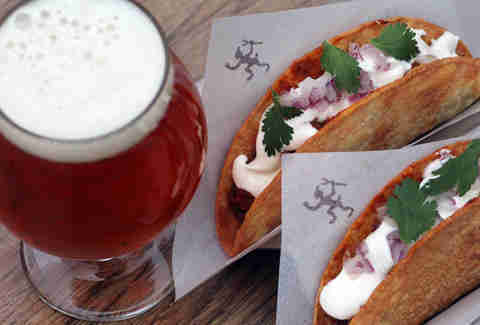 Thankfully you can match up a Firestone Walker Union Jack IPA with a pair of marinated pork belly tacos covered in salsa crema that'll make you forget that Andre likely isn't going to show up.